The country music icons rocked the TODAY plaza with a performance from their first joint album, "The Rest of Our Life," and reveal what’s held them together. 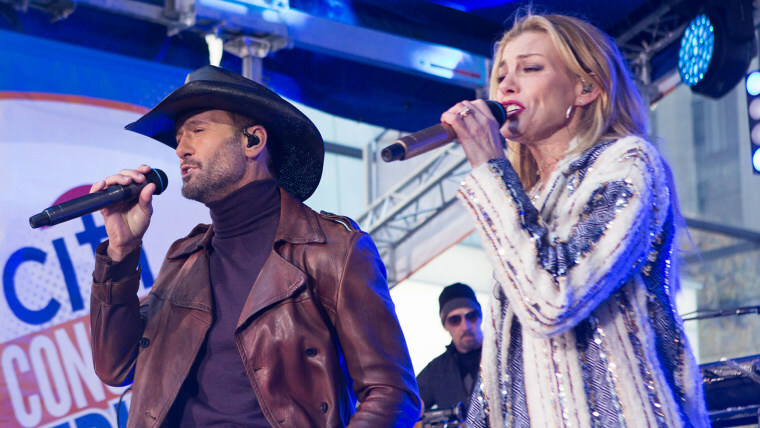 It doesn't get much bigger in country music than Tim McGraw and Faith Hill! The country couple, who've been married since 1996 and have three grown daughters together, stopped by the TODAY plaza Friday to celebrate the release of their first-ever joint album, "The Rest of Our Life," and you could feel the love spreading warmth throughout the whole crowd. It's always inspiring to find a couple who have been together for more than two decades, both work in the same part of the entertainment industry, and who both really love each other so clearly. Before they hit the stage, Hill and McGraw sat down with the TODAY anchors to talk about how they make their relationship work so well. "In the car, I drive," said McGraw. "In the relationship, she drives. We make decisions about things in different ways, but we always talk about it before we do it." "Having three daughters, we sort of acquiesce to mom," McGraw admitted. McGraw and Hill's girls are Gracie, 20; Maggie, 19; and Audrey, 15. That said, there may be a different rule in effect for boyfriends: McGraw appeared on "The Tonight Show" Thursday with Hill and mentioned a somewhat hair-raising experience with his daughter Gracie's first date! Back inside, when asked why their relationship works so well, each pointed to the other. "She tolerates a lot," he said. "You tolerate a lot, too," Hill sent back to him. "I'm not the easiest person." That said, maybe he isn't either: Later on they came back to talk about the time he gave her a real scare when she was expecting their first child. "He hid underneath the bed!" Hill revealed. "I went to get into the bed and he grabbed my ankles. I was eight months pregnant!" So how did she handle it? "She punched me!" laughed McGraw. "She's got a good right hook, too." Fortunately, most of the time, she said, "We like each other; we do actually do like one another." "That's the key for sure," McGraw added. And there it is: the big secret of a long marriage. You have to like it and you have to love it!